Hydration is a vital part of all outdoor recreation - you have to get this right. On long trips and when marathon racing it is convenient to have your Camelbak reservoir outlet close to your mouth so you don't have to stop paddling to drink. This is one really simple idea for fixing the tube within easy reach. Alternately the wire can be fixed to your PFD. Hmmm coffee! So this isn't really hydration but it is an essential part of kayaking for us Melbournians! We have to start the day with a coffee to get us to the launch point, particularly on those mornings when it is a really early start! 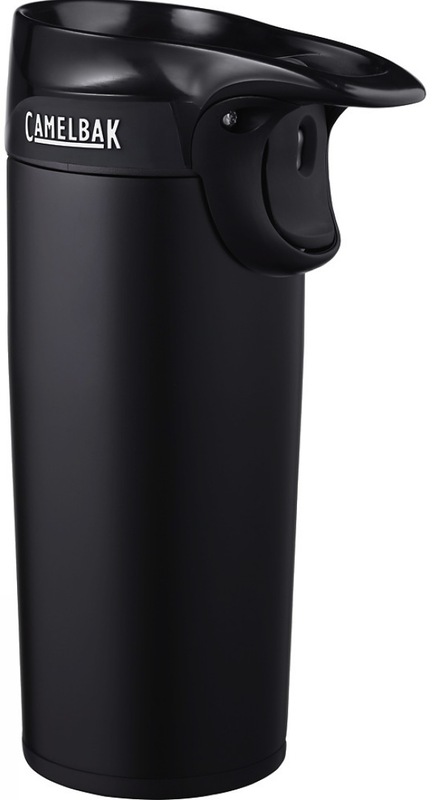 This is a great one-hand operated flask and is truly leak-proof. No more spilled coffee in the car! The stainless steel flask is easy to clean and the top is dishwasherable. It will keep your coffee hot for around 3 hours and drinkable for 4 (based on putting coffee that is at drinking temp. in a pre-warmed flask - so boiling hot drinks should stay warm 4+ hours as per manufacturer's specs). 350ml model pictured - also available in 470ml. We love our flasks - I use mine every day! A one litre water bottle may be all you need on a short paddle and it has the added benefit of ease of portability around cam (or even in the office!). We like this bottle because of the really simple screw cap - it is attached and cannot get lost, it is wide so you can get a big drink quickly and it is easy to keep clean - no nooks and crannies for hidden mould to build up. The bottle has a wide mouth for ease of refilling - no spillage when refilling from your MSR Dromedary or Sea To Summit Pack Tap in camp. This model is the one litre version. It fits firmly under the kayak deck bungees, behind the seat of secured by cockpit tie downs on the floor of your cockpit. Smaller bottles are available (600ml and 750ml) as is a big 1.5L version (limited colours - Charcoal and Sky Blue). Chicken noodle soup for lunch on a cold winter's paddle (or icy drinks in the heat!) - this vacuum flask makes it possible. 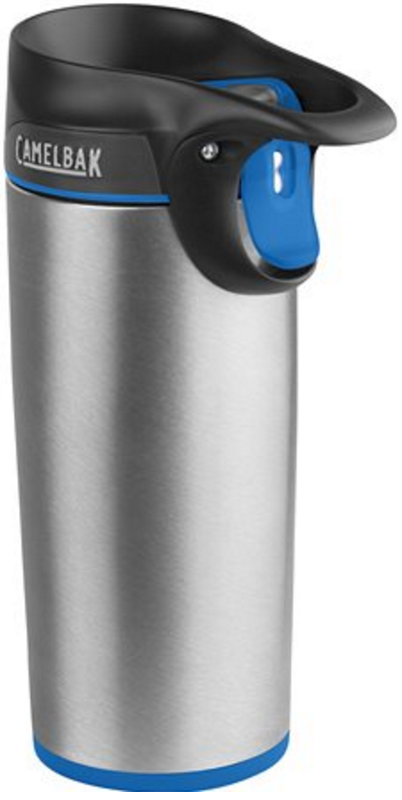 The Camelbak Chute Vacuum Flask keeps beverages hot for up to 6 hours and icy drinks cold for up to 24 hours. The wide-mouth opening makes it easy to fill, while the angled nozzle make pouring spill-proof. The nozzle has an internal thread so it is also comfortable for drinking directly out of. The stainless steel flask is easy to clean and the BPA-free cap assembly can be washed in a dishwasher. Great for winter paddles and commercial trips where we can enjoy the convenience of some hot soup in winter, ready to go! The Kokatat Tributary Hydration System is a product that you can attach to your Kokatat PFD (or any other PFD that does not have an integral hydration pocket and has suitable attachment points). It attaches firmly using four straps that loop through the buckles on the PFD and velcro back on themselves. The pocket holds a 1L reservoir (included) or it could be used to store other small items such as a tow rope. A small reservoir is a good compromise - it is good to have some water on your person, but not too much - raising your centre of gravity. We recommend you only carry water in the reservoir - see the Tips below. A three litre water bladder is ideal for a big day's paddle. This reservoir will fit into Camelbak backpacks, into PFD Hydration pockets (Ultra Trek PFD) and can be carried securely in a kayak cockpit with a cockpit tiedown system. We like the latter as carrying 3 litres of water on your back is quite a weight and can make you top-heavy (more unstable / harder to roll). The drinking tube can be extended and passed up through the waist tube of your spraydeck (make sure you feed it back through if you are landing in surf to prevent entanglement if you capsize). The Camelbak Antidote is the older shape of reservoir, now being replaced by the more tapered Crux Reservoir. If your reservoir is kept on the floor of the cockpit it should be secured to stop it moving around or wedging your feet in the event of a capsize. Use a cockpit floor tiedown kit. Keep your reservoir just for water. Bacteria and mould love residual sports drink sugars left in drinking tubes. Use your water bottle for mixing your performance and hydration powders - much easier to keep clean. Regularly clean your reservoir, paying particular attention to the tubes. Camelbak cleaning kits are available. Milton's Solution (baby bottle cleaner, from the supermarket) is great for soaking the tubes clean. The Camelbak Antidote 3L Reservoir is contained in this durable bag (70D ripstop nylon) that provides insulation and protection for the reservoir. It also features a mouthpiece cover and insulation over the tube. The bag has side clips so it can be lashed to the deck and the insulation will keep the reservoir protected and cooler. We recommend you only carry water in the reservoir - see the Tips above. These bags are the ultimate water carrying system - they are just about the most durable water bag around. They are our preferred water storage on our personal multi-day trips. The bags are made of an incredibly tough 1,000-Denier fabric exterior so they can handle freezing and a fair amount of abuse. The new model is now laminated with an improved BPA-free food-grade polyurethane lining for better-tasting water. Strong fabric webbing perimeter lines allow for easy carrying and hanging up and the new 3-in-one cap allows for easy filling and pouring. A hydration kit turns the bag into a drinking system. Available in 4, 6 and 10 litres, MSR Dromedary bags are great for everything from kayak touring to motorbike expeditions. This is the "wine bladder" style of water bag. It is a great budget option but not as durable as the MSR Dromedary. The cloth bag offers good protection from abrasion but if dropped from height there is the risk of the bag bursting - we recommend not having all your weekend's water in just one bag! Replacement bags are available. The bags are food-safe and do not impart and odour/flavour to your water. They have a handle for hanging up and pack flat when empty. Great for large groups! Available in 2, 4, 6 and 10 litre models, these are handy storage options for any length kayak camping trip. We like the 6 litre bag - holds plenty of water but not too heavy to carry. We use lots of these on our commercial programs. Tip - we fill our Pack Tap bags up the night before a trip, just in case there is a leak. We prefer to carry them in the cockpit - behind the seat or secured by cockpit tie downs and netting in case of a leak in transit.